From early childhood, I loved stories of heroines and saints. I am so very impressed by those great hearted women and men who accomplished brave and selfless deeds for others. At 12, I recall being immensely enthusiastic about nobility of heart. My teacher challenged us to be noble like the saints and to live with integrity and compassion. I started fantasizing about my future and my daydreams were always the same – I was the courageous heroine in the story. Two years later, I joined the Legion of Mary at school just because a persistent nun kept harping at me. At first I went to the meetings with huge reluctance but later with enthusiasm because the seniors were stimulating company and pleasant to hang around. We were encouraged to participate at the Eucharist daily. Because the church was just spitting distance from the school, I tested a daily Mass routine. The intimate encounter with Jesus in the Eucharist became the moment of day that I looked forward to. It was then that I began to experience His personal love for me. I started doing very un-teen things like reading spiritual books and frequenting the Novena service and praying but all in secret for fear of being teased by friends and siblings. The community service assigned to us was to visit the destitute elderly in a Chinese clan home together with a Canossian Sister Barbara Lazzaroni,, a bent and wrinkled Italian sister who spoke fluent Cantonese. She would bring buns and sweets along and it was our task to distribute them while she spoke to those that were very ill and dying. When we visited the following week, the beds of these very ill persons would be empty or occupied by a new inmate. Dying like falling leaves was a weekly affair here! I had never encountered death before; these experiences touched me deeply, especially the love and zeal of a Sister Barbara who prepared them to meet their Maker. Each visit lasted 4 hours and it was very tiring after a morning spent at school. I disliked the stench and squalor of the wards and yet after each visit the experience was an overwhelming and unexplainable happiness. Looking back, it was the joy that came with serving the suffering and unwanted and the adolescent love affair that was beginning with God that were the seeds of a vocation that He planted in my fresh innocent heart. Through the Legion of Mary, I met an inspiring friend who was then an aspirant to the Canossians Sisters. 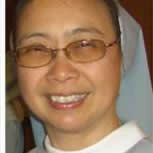 She was discerning her call and lived in community of youth – the other aspirants in a convent. As I was feeling the first stirrings of the Call, asked my parents if I could stay in the Aspirancy. They were sad to let me go, so were my siblings but respected my need to discern my vocation. I enjoyed living in the convent with the other aspirants and was deeply happy. After some months, I began to be irked by idiosyncrasies and quirks of my companions. One would sulk when we did things that displeased her. Another would not chip in the tasks of community living and another had words that really hurt. It was in this situation of being with others and away from home that I began to appreciate my parents and siblings even more. My mother was always there for us and my siblings were neither petty nor difficult.. I began to miss them a lot and realized how much they meant to me and that I truly belonged to them. I wanted to be connected closely with them again, to return home and show them that I love and care for them. The temptation to leave the Aspirancy became strong whenever community life became painful…..I tried to tell God that He can wait till I’m older. I wanted to go home and was looking for a better excuse. It came in the form of a change in the Sister-in-charge. The new Sister not too relational and could not empathize well with us youth. One by one the aspirants called it quits, packed up and returned home. A few of them had become my close friends and their leaving was such a loss. I started to feel a deepness sadness. Looking back, I realized that it was the grief of change. I decided to take a break and requested for a period of home leave to re-discern my Call. It was wonderful to return home to stay, to relish again the gentle attention from my parents. I started to re-connect closely with my siblings, show interest in their lives and contribute to family. They took a while to warm up and wondered what I was up to. Yet I felt truly belonged. But in my quiet moments I knew deep within me that I had responded to a Call to seek God and to live my life in intimacy with Him at the service of His Kingdom. My dilemma was to remain home where life and relationships were comfortable or to follow the Call and strike out into the deep and learn again to belong to a family of strangers. When the time of home leave ended, I was ready to return. My emotional bank account was topped up and overflowing. The intimacy of family relationships forged since infancy, the conversations with Mum and siblings, their encouragement to follow my heart, all helped me to take the plunge again. They respected my Call and gave me the space to pursue it. They promised that they would be there, welcoming and ready to embrace me back home, whenever I wished to return. The task ahead was for me to forge a new way of belonging to my religious family. It was so tenuous then; but the anchoring love of my family was enough for me to dare to risk again and to forge a new belonging. On the day of my official entry into the Novitiate, I gave God my word to stick it through because He promised to walk with me and to love me all the way. When I turned 22, I had just completed initial formation and taken my first vows, my superiors presented me the prospectus of the University of Singapore and asked me to select a course of study that would equip me for teaching. I had taught religion classes before and fun doing it but I loved the challenge of ministering to the sick and relieving pain. But when I expressed my choice to my leaders, I was gently told that I was designated for education and that I had a choice of the Arts or Science faculties only. I obeyed, but it was with feelings of loss. ‘Is this what God really want of me?’ I asked myself. I gave God a chance and threw myself heart and soul into studies. The undergraduate years were stimulating and I enjoyed my friends and lecturers. Towards the end of the course, God’s Will became very clear when He put into my heart a humongous desire to make Him known and loved and then I couldn’t wait to get into the classroom to share life and God with my students. He didn’t but He made it easier. Strangely I was suddenly graced with the instinct of sensitive leadership and eased into the nuts and bolts of the job. But I was stone scared before every staff meeting or assembly talk and would need to refuel in the chapel before I faced the formidable crowd. Then after a while, I realized that the position gave me almost absolute power in the school. And I could use it to make a difference to the lives of everyone in the school. And I did. When I made my choice to follow my vocation to the sisterhood, I thought that I would be in for a quiet, humble ride. God surprised me with scary roller-coasters but He was there all the time providing the comfort of safety belts and the exhilaration of speed and fun.